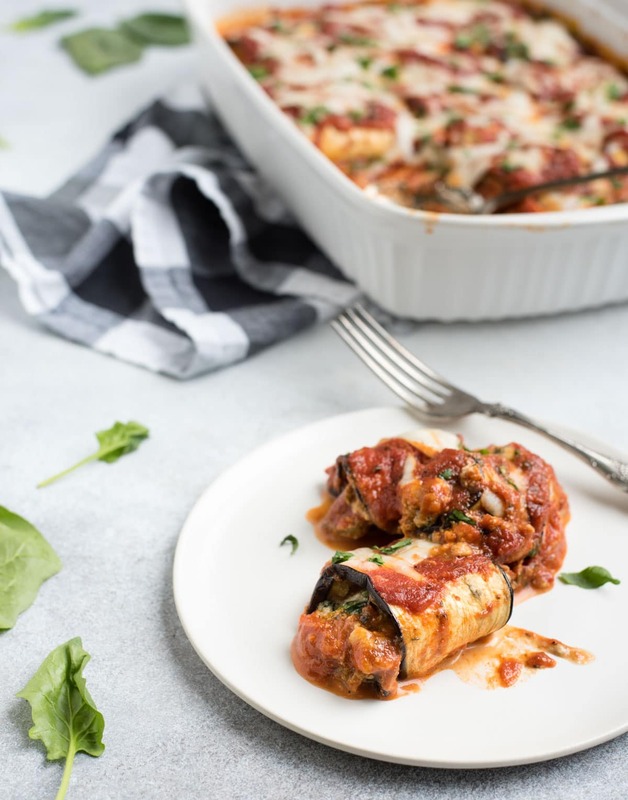 Eggplant lasagna roll ups are a delicious meatless meal for both vegetarians and meat eaters alike. This recipe is loaded with protein, making it extremely filling and satisfying when its overall pretty light and healthy. The marinara and ricotta gives the dish a richness that can’t be beat! I know I say it a lot but this recipe is one of my absolute all time favorites! What? I can’t help having a lot of favorites! This one is truly up there though. Like, pretty darn close to the top. I’ve made these eggplant lasagna roll ups many, many times by now. I’m sure I got the recipe originally from somewhere and I’d love to give credit where its due, but honestly, I can’t remember how or why I started making these and have tweaked my version so much over time that its impossible to trace it back at this point. I’ve tailored this recipe for eggplant lasagna roll ups to pull the best elements of both lasagna and saucy eggplant dishes into one delightful dinner. I’ve also tried to simplify it as much as possible. It still isn’t a ‘simple’ recipe per say, but its as easy as it can be and totally worth the effort. Like lasagna, this recipe has numerous steps and takes some time so it isn’t a quick weeknight dinner. Its totally worth making a Saturday night of it though. This is for those of you whose Saturday nights are filled with tasty food, Netflix binging and glasses of wine. My bar hopping, booze guzzling weekends are pretty much over, or at least few and far between so I’m all about a foodie evening in. I swore I wouldn’t get old… but then it just happened. I really don’t miss it most of the time either. Especially when I get to sit at home and stuff my face with food like this and snuggle the cutest baby I’ve ever encountered. Win-win for this lazy food lovin baby snuggler. Most of what makes this recipe a little extra work is the eggplant. Eggplant just needs a few extra steps to make it taste good. If you skip the salting step, it can taste bitter and will leach out extra water, making the dish soggy and watery. No bueno. Eggplant aside, the rest of the recipe isn’t too complicated. Sure, making individual rolls always takes a touch more work than your standard dump and bake casserole, but I love these kinds of recipes. I love that it creates individual little portions with layers of flavor. I think its why I love my cabbage roll and enchilada recipes so much. If you’re looking for quick weeknight dinners though, this chicken potato casserole or this no-roll layered enchilada casserole are probably a better bet. Here’s how easy it is to roll these puppies up. You do have to roast the eggplant first which is an extra non-pictured step, but all lasagna-esque dishes require some extra prep like this (soaking the noodles, prepping filling, etc.). I absolutely love pretty much all veggies so I was surprised to hear that a lot of people don’t like eggplant, but apparently there’s a lot of you out there that don’t! I’m not a big pea or lima bean fan but I attribute that to eating canned veggies growing up in the arctic which are nothing like the fresh stuff. Eggplant is such a great veggie though and if you’re not used to cooking with it, this is a great entry to eggplant recipe. You can still taste the eggplant, but the sauce, melted mozzarella, and rich ricotta filling make it less pronounced and more subtle. Also, if you don’t typically like the texture of eggplant, you won’t even notice it in this dish. There are so many different textures coming together in the best possible way that the eggplant texture itself doesn’t really stand out. And for those of you that avoid carbs, this is the perfect high protein, low-carb meal. There are 6 grams of protein per roll, so 18 grams per 3 roll serving. If I have the energy, I’ll make a salad to accompany the eggplant lasagna roll ups, but you really don’t have to since its a complete meal on its own. Most of the protein comes from the ricotta but the egg, spinach, and eggplant add a touch more protein to the whole shebang. The filling is pretty quick to make and adds such a rich meatiness that you don’t have to be vegetarian to thoroughly enjoy it. If you don’t have fresh basil, you can use dried of course. Just use a lot less of it since dried herbs are more potent. Once the filling is made and the eggplant slices are roasted, you roll them up like I showed you in the picture above and then plunk them down into a saucy baking dish, layer with more sauce, top with cheese and bake. I normally sprinkle a touch more chopped basil or parsley on top just for aesthetics, but its not necessary at all. This dish pairs just fabulously with a rich, full bodied wine like a cab-sav blend or a red zinfandel. Just typing this is making me want a big plate of eggplant lasagna roll ups and a glass of red wine… and its only 9am. Ha. I guess I should probably wait til noon at least. If you’re still on the fence on whether or not to make eggplant lasagna roll ups, just know that it reheats well so if you make it on the weekend, you can reheat for lunches or a meatless Monday meal that takes absolutely no work to make. If you feel anything like I do about Monday’s, your exhausted self will thank you around 6pm Monday evening. I’ll leave you all to enjoy the rest of your weekend (lasagna rolls or not!). Happy Saturday to you! Eggplant lasagna roll ups are a delicious meatless meal for both vegetarians and meat eaters alike. This recipe is loaded with protein, making it extremely filling and satisfying when its overall pretty light and healthy. The marinara and ricotta gives the dish a richness that can't be beat! Cut top and bottom off each eggplant and cut into 1/8” slices lengthwise (easiest using a mandolin, makes about 18 slices). Sprinkle eggplant slices with salt and let sit overlapping in a colander for at least 30 minutes, preferably 1 hour. Rinse with cold water to remove salt and pat dry with paper towels or a kitchen towel. Spray a baking sheet with cooking spray and lay eggplant slices out in a single layer (may need two baking sheets or to roast in two batches). Sprinkle lightly with salt and pepper and bake in oven for about 10 minutes. Remove from oven and let sit until cool enough to handle. Reduce heat to 375° F.
Meanwhile, heat oil in a skillet over medium heat. Add onion and cook for 5-6 minutes until onion is translucent and soft. Add garlic and cook a minute longer. Add spinach and cook down for 1-2 minutes until just wilted. Remove from heat and set aside. In a small bowl, whisk the egg with a fork. Add ricotta, nutmeg, and basil and stir to mix. Add ricotta mixture to cooked down spinach. Season to taste with salt and pepper (about ½ tsp. salt and ¼ tsp. pepper). Spoon about 1 cup marinara sauce into 9x13” baking dish. Spoon about 2 Tbsp. of ricotta spinach filling into the large end of an eggplant slice. Roll and place seam-side down into sauced baking dish. Repeat with remaining eggplant slices, making 3 rows of six. Spoon remaining marinara sauce over eggplant rolls. Sprinkle with mozzarella cheese and bake for about 25 minutes until cheese is melted and filling is starting to ooze out the sides of each roll. 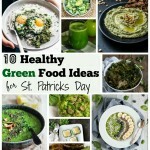 Remove from oven and sprinkle with fresh parsley or additional chopped basil before serving if desired. A lot of people don’t understand the importance of salting, and salting HEAVILY when it comes to eggplant,(you’re going to rinse it off in cold water anyway)… you get all that gray, bitter water out; So Key. Great recipe. Yes! I’ve tried skipping that step in an attempt to make a recipe faster before and ended up with a watery mess in the end. Eggplant definitely takes some finessing, but totally worth it in my opinion.